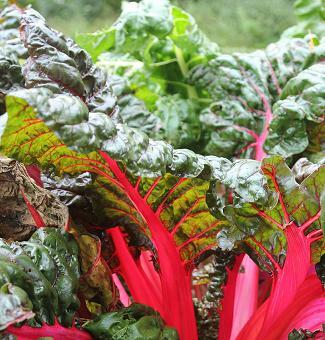 It is difficult to distinguish a history of the Swiss chard from that of beets. They are closely related and originated in the regions surrounding the Mediterranean. They are used almost extensively in Mediterranean cooking. It is well known for the nutritional value, and the hardiness of the plant. Once established, it will grow and be useful through the whole season, even past a hard frost. Though it has a bitter flavor when eaten raw, cooking it softens that flavor, making it a delicacy. 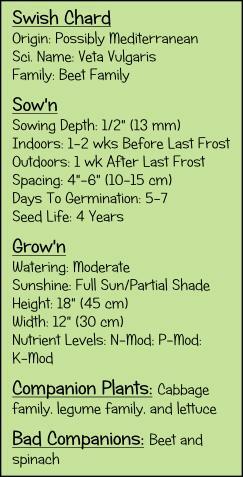 Sow seeds directly outdoors in early spring about 4 to 6 weeks before the last frost. Grow 3 to 4 inches apart to harvest leaves as they grow, or 12 inches (30 cm) apart to harvest the whole plant. Put down 3 inches (7 cm) of mulch around the plant to protect the roots and keep them moist. Water Swiss chard evenly, but not heavily. It shouldn’t need any additional fertilizing if soil is composted well in the fall. Harvest individual leaves when they are young about 4 to 6 inches long. When harvesting the entire plant, cut leaves at soil, but leave the roots to sprout new leaves. If you plan to do this, then you might want to plant the Swiss chard in a succession every 6 weeks to have a continuous supply. Harvest outer leaves whenever you want to use. It is perishable, so use soon after harvesting.